Italian architects, LAD and hypnos studio, have collaborated to design ‘sovraparco’ – a proposal for a suspended garden in the heart of milan. the location for this urban regeneration project is piazzale loreto, an area dominated by fast-moving traffic. 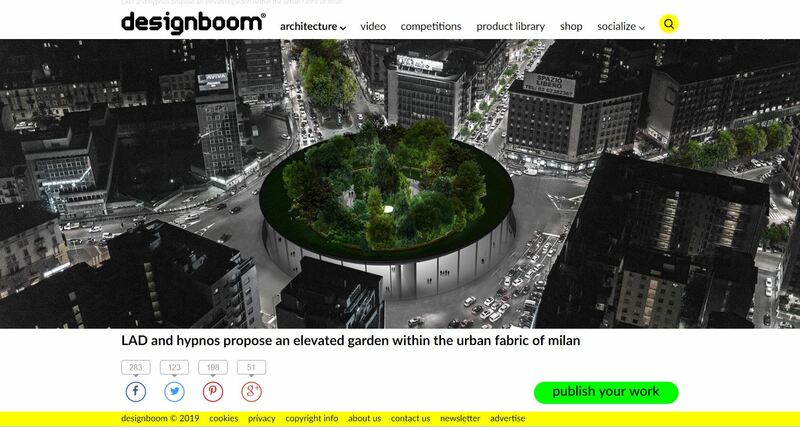 the concept looks to radically transform the existing roundabout by constructing an elevated green area over the entire junction, bringing a generous slice of nature into the city environment and creating a new public plaza space for the people of milan to gather and relax. the proposal envisioned by LAD and hypnos is defined by two levels: the plaza space at ground level, and the elevated garden above. under street level, the site marks an important junction of the milan underground. the project therefore proposes to create an access to the subway, while the plaza space is designed to be equipped with various stores, coffee shops and restrooms. above ground, a large circular form is imposed over the footprint of the existing roundabout. by raising the architectural intervention at the edges, a concave basin shape is proposed, creating a green haven in the middle of the busy city fabric. floating above the plaza, the green space forms a protective shell from the city’s traffic and pollution. access to the garden is gained by stairs and an elevator, and once inside it is organized on two flat levels. the first level hosts stairs and an elevator, as well as some services and covered spaces. in the center there is a large oculus, opened downwards to the plaza underneath. the ‘sovraparco’ project is designed to form a new landmark within milan while also bringing vegetation and greenery into the city. the architectural concept offers a place for people to relax, to read or even to organize small parties or gatherings. the design will be presented during the ‘from spaces to places’ convention at rome’s university, la sapienza, on march 18th 2019.